Back in 1919, mining was intense in the region. A few mountain sides mining collapsed, and the Blue Lake was created as a result. Blue Lake Natural Monument was declared natural rezervation and is in custody of Maramures Mountains Natural Park Administration in partnership with an NGO which aims to conserve the landscape for scientific and educational purposes . Blue Lake protected area is located on the territory of the city of Baia Sprie in a young oak forest on the southern slope of Mine Hill at an altitude of 530 m and has an area of 0.5 ha . The lake formed by the collapse of old mine workings during 1919, 1920 . Around the lake there are a few samples of pine which give the area charm . Its colors change from the turquoise captured in my picture to darker shades of blue in the winter – hence its name. 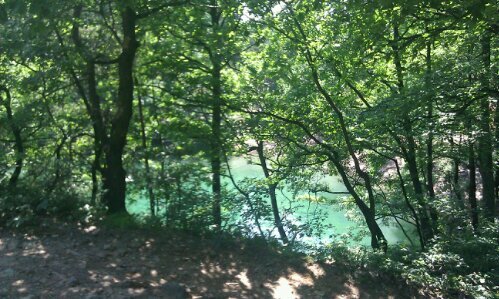 It was great climbing tthe steep path o the lake and then dipping in the refreshing water. Posted in English blog and tagged as advice, Baia Mare, baia sprie, blue lake, lacul albastru, maramures, Romania, tips, tourism, travel.